Image caption STM Sports played Cefn Albion in Saturday's FAW Trophy semi-final. Fans at the FAW Trophy final were warned they faced "immediate ejection" if officials heard abuse after racism claims marred a semi-final. There were calls for Saturday's final between the Wrexham club and Pontardawe Town in Aberystwyth to be postponed. Cefn Albion said it had not been made aware of issues from the semi-final. A fan told BBC Wales there was "no controversy" at the final, which Cefn Albion won. Nick Dorward, who takes photographs for Pontardawe Town, said: "It was absolutely fine, they were very loud supporters but there was no controversy at all - they were a group of people who like to enjoy themselves. "It was marshalled very well." It comes after allegations were made that their fans repeatedly racially abused Hermon Yohanes and Lamin Conteh of Cardiff side STM Sports in last month's tie in Newtown. Mr Conteh said he "had never come across such racism and poor behaviour in my entire football career", adding racist abuse was shouted into his face. Image caption Aberystwyth Town liaised with police and the FAW to ensure Saturday's final was "appropriately policed"
The Welsh National League (Wrexham Area) club said it prided itself on "being ambassadors for the community and on providing a welcoming and friendly environment for players and supporters from all backgrounds". Albion added they would "not tolerate any behaviour which brings our good name into disrepute". STM Sports, charity Show Racism the Red Card and Cardiff Central MP Jo Stevens all urged the FAW to call off Saturday's final while the investigation takes place. 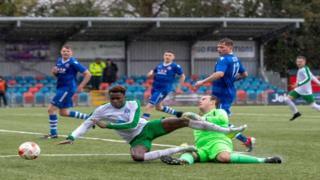 Aberystwyth Town, hosting Saturday's final at its Park Avenue ground, said it had been liaising with police and the FAW to ensure the game is "appropriately policed". The club said it was committed to confront and eliminate discrimination between the two third-tier clubs. Aberystwyth Town said "any such incidences will also be reported to the appropriate authorities for investigation and if necessary pursued through disciplinary or legal due process".